Representing the perfect combination of high performance and high value, the Denon AVR-S530BT delivers superb sonic fidelity along with a host of advanced features including full 4K compatibility, HDR (High Dynamic Range), and ARC (Audio Return Channel) for the complete home theater experience. 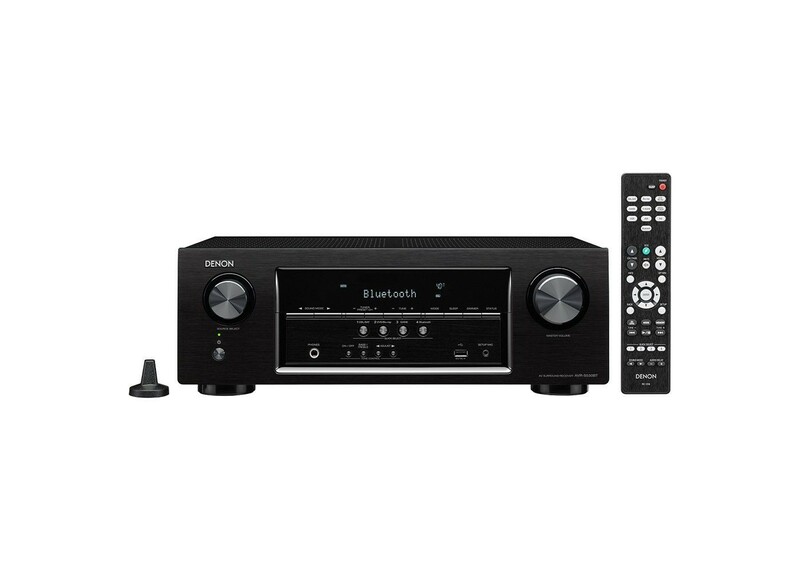 Thanks to built-in Bluetooth, the AVRS530BT receives your favorite music wirelessly from any compatible device, and the dedicated Denon 500 Series Bluetooth remote app offers unique control options fromyour smartphone. Featuring high current discrete power output devices on all channels,the AVR-S530BT delivers high power and is rated at a maximum of 140 watts per channel. There’s also an Auto Eco mode that adjusts the maximum power available according to the volume level. For compatibility with the widest range of loudspeakers the AVR-S530BT is equipped with low impedance drive capability that provides operational stability with 6 ohm speakers. Equipped with 5 HDMI inputs, the AVR-S530BT features support for 4K Ultra HD full frame rate 60 Hz pass-through on 3 inputs along with 4:4:4 Pure Color sub-sampling, HDR, and BT.2020 passthrough on all HDMI inputs. It’s also equipped with HDCP 2.2 signal handling, a requirement for 4K Ultra HD copy-protected content. Thanks to built-in Bluetooth, you can easily stream your music from any compatible Bluetooth phone, tablet or computer. Simply select the AVR-S530BT from your device’s Bluetooth menu to turn on the receiver and start playing your music. The AVR can remember up to 8 paired Bluetooth devices, so family and friends can listen to their favorite tracks. Download the 500 Series Denon Remote app and control your AVR-S530BT from your Bluetooth device. Functions include On/Off,Volume Up/Down, Mute and Source Selection. The app is available for both iOS and Android. In addition to numerous analog and digital AV connectors, the AVRS530BT features a convenient USB port on the front panel that’s compatible with portable USB devices, and can play back a wide range of audio file types including MP3, WMA, FLAC and MPEG-4/ AAC tracks.